Friendly new management team, welcoming staff, delicious food! Even has a Gin Bar! 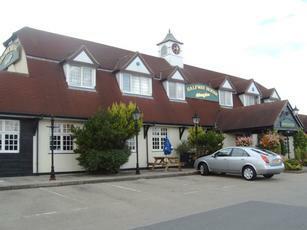 function room next to the pub with separate entrance, own bar and restrooms! There is a massive marquee around the back perfect for weddings and large parties! Cant go wrong - give it a try - you wont regret it! Grotty pub next to a travel lodge and little chef. The last review said they had ran out of ales, well that was 5 years ago and they're still not working! Worth visiting only if staying in the hotel next door. In the night I was there, all three ales ran out. From memory - GK IPA & Old Speckled Hen were two of them. Suggest hotel visitors go elsewhere for food & drink first, then return here before you go over the drink driving limit.